WOW Escape Journey 05 is the fifth episode of this point & click escape game series developed by WOWEscape. In this game with six levels, barn swallows are the most widespread species of swallow in the world. They are extremely agile in flight and spend most of their time flittering around us catching insects. Every year, the birds move 8300 km by sea route from Argentina to California for their breeding. Help the barn swallows overcome all obstacles during their migration in each level by finding useful objects, hints and by solving puzzles. Click on the objects to interact with. 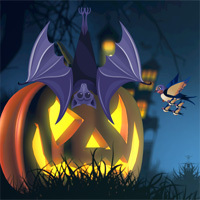 You are going to play level 5 now: after their sea journey, the birds are taking a rest in a Halloween forest. But unfortunatly, a Halloween bat trapped the birds! Your mission this time is to rescue the birds. Good luck and have fun! Stuck in the second set on the puzzle where you have to put the correct figure in the question mark. Got a stone spearhead in my inventory and can't find where to use it. Missing one circular-saw like creature and have one puzzle unsolved. Any clues? The wand you get at the end: you have to go back to first set of scenes and use it on the creepy bat that looks like it's eating something.